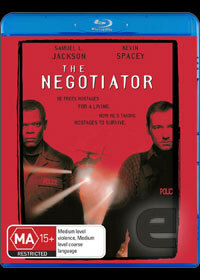 The Negotiator is one of the best thrillers of the 90s. Essentially Die Hard all over again, its elevated by two compelling performances by Samuel L. Jackson and Kevin Spacey. The hook this time is that instead of Alan Rickman with a German accent as the antagonist, it’s Jackson’s hostage negotiator, Danny Roman. Framed for his partner’s death, who was killed for getting too close to exposing an embezzlement fraud, Roman holes up on the twentieth floor of 77 West Wacker Drive in Chicago with four hostages including police commander Grant Frost (Ron Rifkin) and internal affairs officer Niebaum (the late J.T. Walsh). And he won’t leave until the real culprits are exposed. Cue the arrival of fellow negotiator Chris Sabian (Spacey). Sabian is an independent observer who is proud of his zero casualty record. Interested only in peacefully diffusing the situation, he has a hard time preventing the police hordes from storming the building by force. An exciting cat and mouse game ensues as the two intelligent leads battle the bureaucracy and corruption around them in their search for the real culprits. 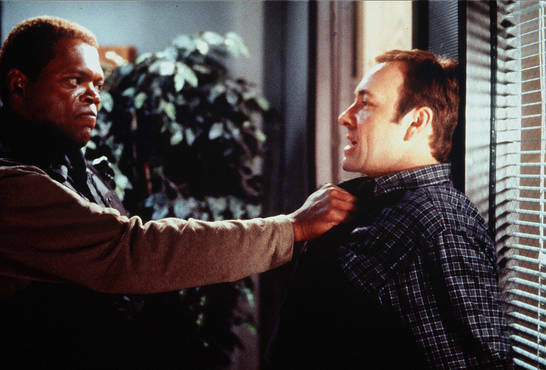 It's reminicsent of other mano-o-mano confrontations such as Denzel Washington and Gene Hackman in Crimson Tide. Not as well written as that film, the screenplay is formulaic but elevated by small, clever details. A reoccurring argument about the ending of Shane, for instance, is infinitely more interesting than the usual action schtick of bellowing expletives at each other. Elevated almost entirely by performances, the two compelling leads are accompanied by a rich cast of stalwarts playing exactly to type, including Rifkin, Walsh, David Morse and John Spencer. Paul Giamatti, before cementing a reputation as a character actor in Alexander Payne’s Sideways, is also in the cast, playing a shifty con man and one of Roman’s hostages. Set almost entirely within one office building in Chicago, there’s a terrific sense of tension and claustrophobia, punctuated by bursts of action as the force attempts to take Roman down before he learns too much. Director F. Gary Gray, who also directed the equally enjoyable remake of The Italian Job knows how to maintain tension and keep the energy high. If it falters, it’s in the finale, which, like the ending to Die Hard with a Vengeance, feels tacked on and superficial. It’s appearance on Blu-ray is a mixed blessing. An uncomplicated release, the film is presented well in HD, free of artefacts and visual blemishes. It's better than the DVD release, but still lacks the clarity of the top tier blu-ray discs. There is also little in the way of special features. The only inclusions are a short documentary entitled “The 11th Hour: Stores from real Negotiators”, a short 16 minute featurette about the making of the film and the theatrical trailer. The extras are only in 480i and have two channel sound. While far from a great film, there’s much to enjoy here. Sometimes all you want is a solid action thriller, and on that score The Negotiator is an unqualified success.